Toon's Tunes : Spring Fling Tour arrives here soon: Cage The Elephant, Silversun Pickups, Foals, and Bear Hands! 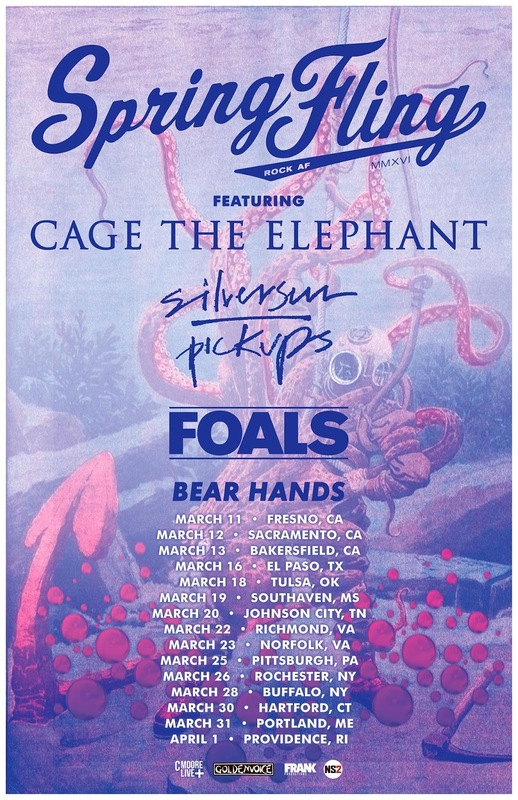 Spring Fling Tour arrives here soon: Cage The Elephant, Silversun Pickups, Foals, and Bear Hands! When “Ain't No Rest for the Wicked” by Cage the Elephant hit the airwaves in 2008 one thing was clear; you could not get this tune nor band out of your head, and these boys were planning on staying there. Cage the Elephant are a five-member band from Bowling Green, Kentucky. How could you describe their eclectic sound? Well let’s say it’s a mixture of blues, punk, folk, classic rock, garage and soul with Matt Shultz’s raw voice and intense vocals topping it off. It is impossible to explain it in a simpler fashion, because their music is everything but simple. When the band branched out more after their self-titled album, they proved that they could excel at all genres. As rhythm guitarist Brad Shultz explained after first hearing “Cigarette Daydreams”, realizing that they did not have to stick to a certain sound; they could do whatever they wanted to. And they have proven this time and time again. Cage The Elephant are well known to put on a show that parallels their penchant for the unexpected. Within minutes, Matt will be on the barricades with the fans, ripping his shirt off or writhing on the floor, belting those tunes out while dripping in sweat. You will catch him and the other band members crowd surfing, you’ll watch them all rock out. And you will find yourself caught up in this: dancing, singing and probably falling even more in love with CTE. These guys put their hearts and souls into every single one of their performances, and you can expect nothing else during their tour with Silversun Pickups which hits Sacramento on Saturday March 12th at Sleeptrain Arena. The Spring Fling tour kicks off in California, Silversun Pickups’ home state. Originating in LA, the band has been together since 2000 and are more than a band; they bonded like a family. On September 26, 2006, the band released their debut album and two of the four tracks made it to the Modern Rock Billboard, and they haven’t missed a beat since. The sounds of the band are eclectic; classified as “Alternative” but with their distorted guitar riffs and lead singer Brian Aubert’s crooning voice, they are incomparable; their sound is, simply, “Silversun Pickups”. They have developed a huge following, and released hit after hit, touring with major bands such as Muse and Placebo. In concert, the band demonstrates its closeness by seamlessly working their different personalities and sounds together. They go from an upbeat song like “Lazy Eye”, which everyone knows the lyrics to, then crash down to a more mellow tune, without losing their magnetism and causing concertgoers to feel like they are a part of the music. Aubert meshes with the crowd by making them feel involved. The band does not lose momentum from start to finish, and you feel like you have been taken on a ride with his bewitching voice. These two bands toured together in 2009, putting on amazing shows night after night, each band in its particularly rare sound compliment the other. We’re going to be lucky enough to experience it again in a couple of weeks, here in Sacramento! You can count on being swept away by the wonderful, fascinating sounds of Cage the Elephant and Silversun Pickups. And more… Foals and Bear Hands too!!! Did you get your tickets, yet?? ?